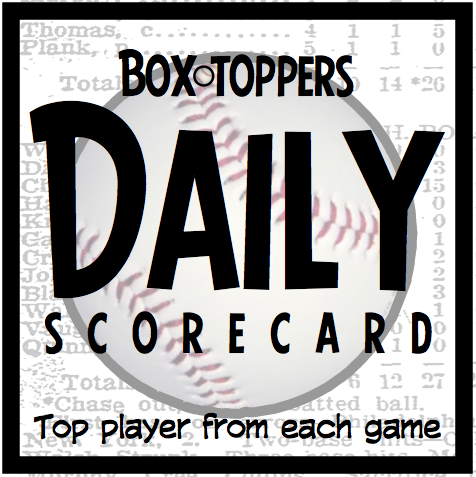 Brewers pitcher Wily Peralta is Tuesday's Player of the Day. Peralta pitched a complete-game, three-hit shutout in the 2-0 win over the Reds. Adrian Beltre of the Rangers is American League Player of the Day. Beltre hit two home runs, drove in five runs and went 4-for-4 in the 8-4 win over the Orioles. Justin Upton of the Braves is National League Batter of the Day. Upton homered and went 3-for-5 in the 6-4 win over the Marlins. Standings update: Cardinals pitcher Adam Wainwright rises to sixth place among players in Box-Toppers points for the season (see the updated Top 10 list on the home page). Wainwright (7IP 1R 9K) was Player of the Game in the 9-5 win over the Astros, earning 1.0 Box-Toppers point, giving him 11.7 for the season. Wainwright and Peralta had identical 8.0 Box-Toppers game scores, but Peralta broke the tie and earned Player of the Day honors (and an extra Box-Toppers point) because he had more innings pitched. Peralta receives 2.0 Box-Toppers points for being Player of the Day. Beltre receives 1.7 for AL Player of the Day. Upton receives 1.5 for being NL Batter of the Day.